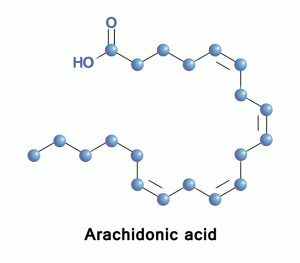 Arachidonic acid is classified as an unsaturated, essential fatty acid that is a variant of the omega-6 fatty acid. The nutrient is commonly found in animal and human fats. Likewise, it can be found in the liver, brain, and glandular organs. According to the open chemistry database Pub Chem, arachidonic acid is formed through dietary linoleic acid synthesis. Eating foods high in omega-6 fatty acids enable the body to produce arachidonic acid, according to the University of Maryland Medical Center. To do this, omega-6 is first broken down into gamma-linolenic acid (GLA). The GLA, which can be found in evening primrose oil, black current seed oil and borage oil, is then converted into arachidonic acid. The beneficial compound can be obtained from vegetable oils, nuts, and seeds. The American Heart Association noted that meat, eggs, and some fish contain high levels of arachinodic acid as well. Aside from this, the National Cancer Institute states that chicken is an excellent source of the important nutrient. Arachidonic acid can also be gained from taking supplements that contain the nutrient. Arachidonic acid’s main role is maintaining a healthy brain and central nervous system. According to the American College of Neuropsychopharmacology (ACN), arachidonic acid helps regulate neurotransmitter release. The nutrient is used to control ion channel activities, protein kinases and neurotransmitter uptake systems once it is metabolized. Arachinodic acid is known to protect the brain from oxidative stress as well. Aside from this, the nutrient is touted to stimulate syntaxin, which activates the growth and repair of neurons. The essential fatty acid is also crucial in the early stages of neurological development in children, an entry in the Supplement Police website noted. Previous studies have shown that children who had higher arachidonic acid intake are far more intelligent than those who did not take the nutrient. Increased arachidonic acid intake is also shown to bolster social interaction in people with autism spectrum disorder. A study released in 2012 shows that taking the essential fatty acid with docosahexaenoic acid (DHA) may help improve social interaction in patients. Likewise, several studies have demonstrated that higher arachidonic acid consumption during the early stages of Alzheimer’s disease may help mitigate the progression of the debilitating cognitive disorder. The essential fatty acid is also touted to lessen the impact of the diseases during its later stages. A 2013 study has also revealed that arachinodic acid may help increase muscle mass. The National institutes of Health says that arachidonic acid promotes the overall health of the liver and other organs. Furthermore, the ACN notes that the nutrient may improve heart health. According to the health association, eating a diet high in both omega-3 and omega-6 fatty acids and their derivatives may help reduce the odds of developing various cardiovascular diseases. Arachidonic acid is particularly important in maintaining a healthy brain and central nervous system. Likewise, the essential fatty acid is beneficial in promoting muscle growth. The nutrient also plays a key role in supporting the heart, liver, and many other organs. Arachidonic acid mitigates Alzheimer’s disease progression at any stage. Arachidonic acid improves neural connections and markers of autism. Arachidonic acid maintains brain and central nervous system health. Arachidonic acid promotes muscle growth and development. Arachidonic acid supports the heart, liver and many other organs.